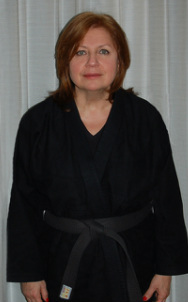 The original “Battle Maiden”, Louisa has been active in martial arts for over 25 years. She has been awarded multiple black belts and tournament medals in both Jujutsu and Karate combat arts. The majority of her recent training (last 14 years) is in practical/street self defense, from which she has a black belt in Karate, Combat Jujutsu and Krav-Maga. With an emphasis on "evolving", Louisa continues to train and participate in specialty self defense seminars of different styles and integrates the most effective techniques from Combat Jujutsu, Krav Maga, Judo, Karate, Brazilian JuJutsu and other martial arts. As a qualified instructor, Louisa has trained with and assistant instructed security staff, law enforcement, team Canada gold medalists, corporate, educational and the general public of all ages. Featured with her daughter in the local news media as someone almost 50 and still judo flipping large men (Link to Article), Louisa has proven that her smaller size and age is not of importance and she is determined to empower other women and men with the same simple, but life changing skills. Louisa is the living example of how to use your mind and technique to overcome size and strength. Combat Jujutsu: Black belt Instructor. International Federation of Ju-Jutsuans (IFOJJ) and FUMA (Federation United Martial Artists). 2006 Silver medalist. Krav Maga: Black belt and certified Israeli Krav International (IKI) instructor. Go Ju Ryu Karate: Black belt Instructor and women’s self defense specialist. Kumite and Kata medalist. S.O.A.R Level 1, 2, 3 certificates. Intense wilderness survival training. Emergency Certification: First aid, CPR and AED (Red Cross). A family man, James is absolutely determined to offer the best possible programs that will positively affect the lives of women, children and men of all age and sizes. With 30 years experience, James holds multiple black belts, certificates and gold medals in Jujutsu, Karate, and Judo. The majority of training is in practical/street self defense (last 15 years) from which James has co-presented various women’s, public, security, educational, corporate and other seminars. With an emphasis on "evolving", James continues to train and participate in specialty self defense seminars of different styles and integrates the most effective techniques from Combat Jujutsu, Krav Maga, Judo, Karate, Brazilian JuJutsu and other martial arts. Students James has trained in classes include security staff, law enforcement, team Canada gold medalists, and the general public of all ages. At only 12, he was presented a black belt from the respected GoJu Ryu Japanese masters and was the youngest in Canada to be awarded that honor. Combat Jujutsu: Black belt & Senior Instructor. International Federation of Ju-Jutsuans (IFOJJ). FUMA (Federation United Martial Artists). Go Ju Ryu Karate: Black belt Instructor. Certificates: Active Shooter Preparedness Certificate (UBC), The Ultimate Martial Arts Workshop, Total Submission Personal Protection and Fighting sciences, Level 1, 2 & 3 Nightclub Protection (public relations, legal issues, security operations, personal protection and combat control tactics), assistant instructor. Total Impact Instructor for women in areas of combat psychology, offensive fighting skills, strategy and tactics.